The menu at Dean Fearing’s Rattlesnake Bar is a foodie’s dream, no matter what your dietary preferences are. Handmade nachos with smoked chicken and Maine lobster. Jalapeño elk corndogs. Soft pretzel bites with sriracha butter. Fried olives with Texas feta (Texas feta!! What?!). Every item on the bar snacks menu, a place where corners are so often cut at other establishments, is tediously curated at Fearing’s. It baffles me that on my last trip to Dallas with Steve (he works there often), we visited the Rattlesnake Bar almost every night, but I never got acquainted with these glorious snacks. Why am I just now discovering this list online as I write this blog post??? Easy answer: adjacent to the bar, over yonder in the hotel lobby, I hovered nightly around the “Guacamologist” stand. Yes, you heard me right: guacamologist. It’s a real title…or at least the one a certain line cook gets to dawn for the two hours nightly of free chips, guac, and margaritas in the hotel lobby. And when I have a choice between paying for drinks and snacks, or being fed them for free, you know I’m going to go with the latter. To be honest, I don’t know if the roasted garlic guacamole recipe that the guacamologist distributes along with his goods is Fearing’s recipe, but since Dean is the man who runs all the hotel dining, I made assumptions with my recipe title. 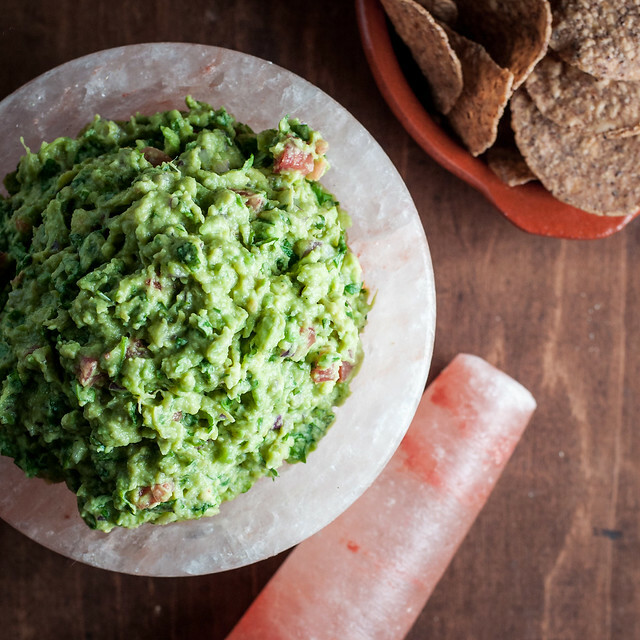 Regardless, you must try this guacamole. It’s simple, with a twist or two on the classic that adds that sophisticated, subtle roasted garlic sweetness and an extra creamy texture. The source of the texture is controversial, and I won’t gloss over it. We take guacamole, perhaps the best “naturally” vegan salty snack, and adulterate it with just a dollop of sour cream. The horror. 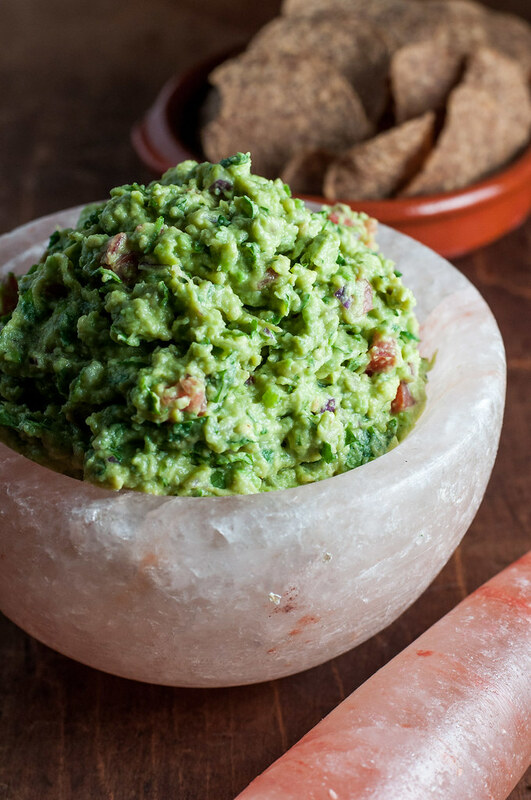 I love sour cream, but the thought of it in my guacamole quickly brings to mind the faux-guac “avocado spread” of Subway or the variety you buy in the refrigerator case near the chip dip. First ingredient? Sour cream. But it’s not like that with this recipe, and if I can be convinced to de-veganize my guacamole and throw in a little scoop of sour cream, then please trust me that it’s worth it. 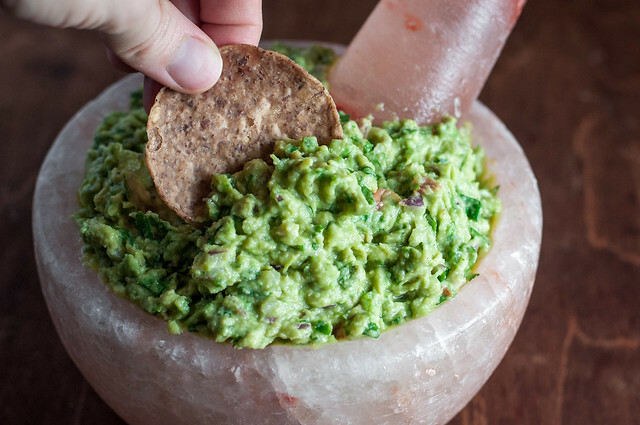 The sour cream is crucial to achieving the result I tested with this specific roasted garlic guacamole, but if you’re fine with altering the recipe and need or want to keep it vegan, you can omit the cream. Just don’t even think about messing with the garlic. Is this blog turning into a Tex-Mex food blog? Technically no, but stay tuned for status updates. Most important lessons, I learn the hard way, and grocery shopping is no exception. Here’s the short version: when you plan to make a produce-centric recipe that relies on one crucial ingredient, such as avocados for guacamole or peppers for stuffed peppers, buy an extra or two. I’m sure you can predict the long version: I’ve planned to make guacamole for many a party, only to get home from the grocery store and learn that the inside of one of two avocados (I know, why would I make such a small bowl) is so ripe it’s gray, or it’s practically crunchy. With no time left to run to the store. First world crisis. Avoid this minor (but so major) issue by doing what my frugal self took so long to learn–just buy an extra! Or even two. If they’re all okay, then you just make extra or save it for tomorrow’s smoothie or salad. 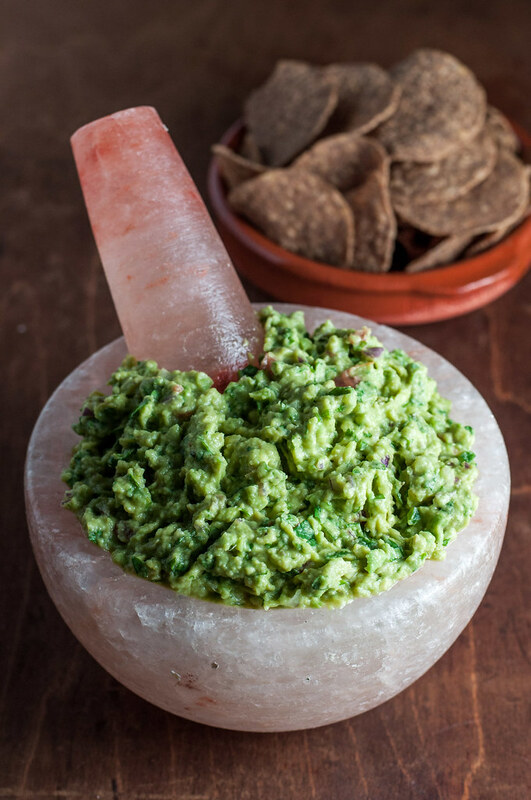 Note: Guacamole doesn’t photograph too well, but the Himalayan salt mortar and pestle I served it in sure did help! Here’s the link (not sponsored). Since it’s made of salt, it will make your food extra salty. Great for grinding spices, not great for perfectly seasoned guacamole. Save yourself by putting a little piece of plastic wrap in the bottom before serving it up. Just like everything else it touches, roasted garlic and its subtle sweetness takes everyday guacamole to a whole new level. To roast the garlic, preheat oven to 400 (F). Remove excess outer papery layers from the head, then use a sharp knife to chop off enough of the top to expose most of the cloves. Place face up on a sheet of foil on top of a baking sheet and drizzle with olive oil, rubbing it over the exposed cloves. Completely seal the head in foil, then roast on middle rack 45 to 50 minutes. When done, exposed garlic surface should be light to medium golden brown. Unwrap and let cool until you can touch it. Push roasted cloves out starting from the based of the garlic head. For this recipe, mince enough of the roasted garlic to make 2 teaspoons. Save the rest in the refrigerator to add to salsa, mayonnaise, soups, etc. 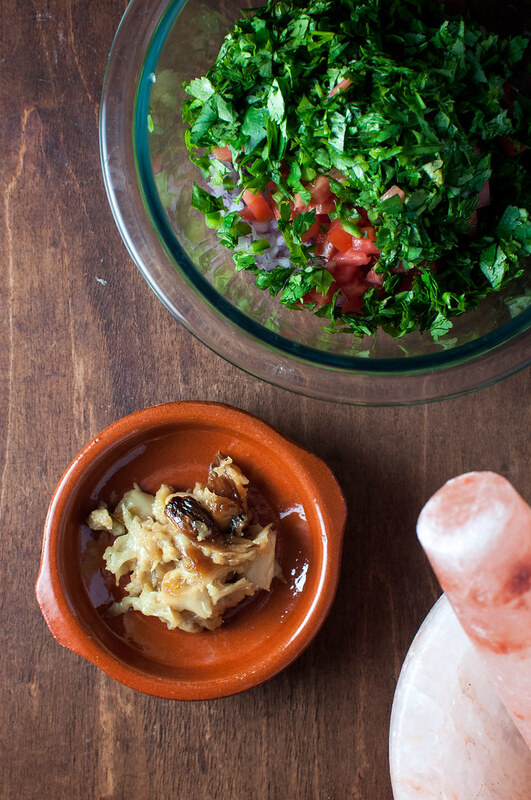 Prepare onion, tomato, jalapeño, and cilantro and combine in a medium bowl. 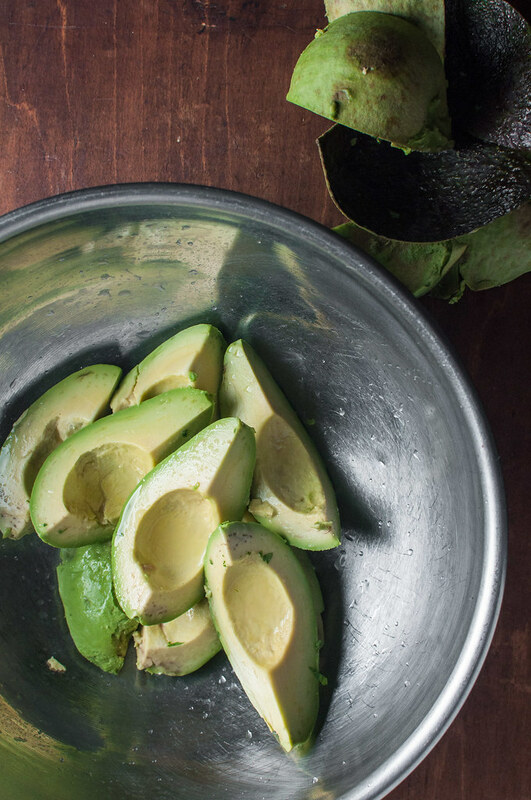 Halve and remove pits from avocados, then cut into quarters and remove skin. Place avocado in a large bowl with 2 teaspoons of the minced roasted garlic, juice of the lime, and salt. Mash thoroughly with a fork or potato masher, until only a few small chunks remain. Stir in reserved chopped ingredients, plus sour cream and a few grinds of black pepper. Taste and adjust seasoning, adding more salt, pepper, or lime juice. 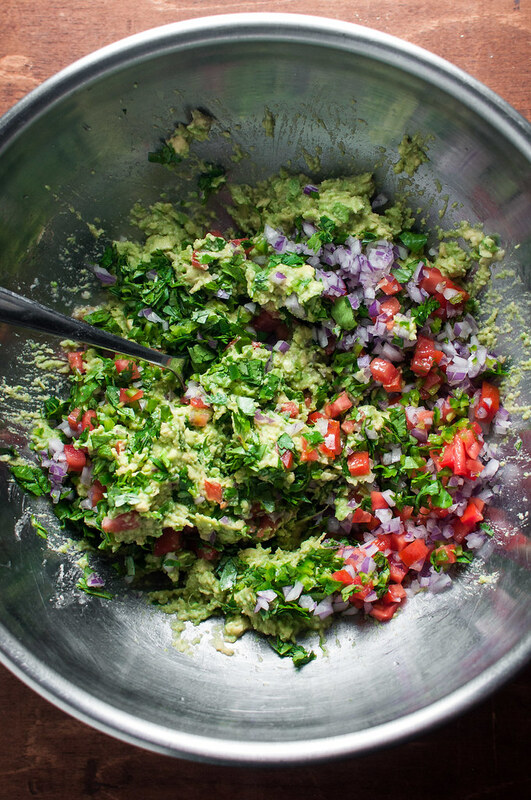 If making ahead, stir well to remove any air pockets, then cover surface of guac with plastic wrap to prevent browning. Serve with chips and margs! The cook time is entirely inactive! No babysitting or stirring needed. 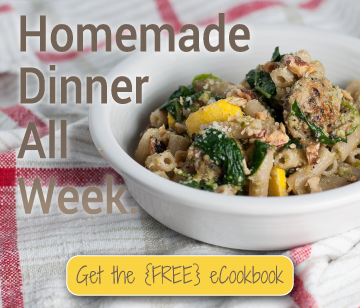 The recipe is gluten free and vegetarian. Note: This page contains affiliate links. It does NOT contain sponsored content. Affiliate links (to products I recommend, on Amazon) offset my ingredient and website maintenance costs, so I can keep bringing you Tex-Mex recipes like this one. Thanks!